Ah, the idyllic fantasy of farm life: chickens scratching next to the duck pond, turkeys and geese intermingling, everybody happily clucking, honking and gobbling together. The reality is neither so simple nor so peaceful. It's possible to keep a very few other varieties of poultry with chickens, but none are actually compatible in the sense of peacefully sharing the same space without risk. Normal social behavior is a primary issue with mixing poultry. Social birds develop strict hierarchical systems to keep everyone in their group in line. This phenomenon has a name you're already familiar with: the "pecking order." It determines who gets access to which roosts, nests, food, water, who gets beaten up most and who does the beating -- and with chickens, there's plenty of beating. Minor fights are common, they increase in frequency and intensity under any kind of stress, including heat, cold, crowding and population change. Fatalities aren't typical, but they also aren't rare. Throwing another species with different behavior patterns and communication into this mix is asking for trouble. No doubt you've heard the terms salmonella, bird flu and West Nile bandied about. The one thing they have in common is our fine feathered friends. While these diseases are issues for human beings, birds also carry scary germs that can afflict one another. 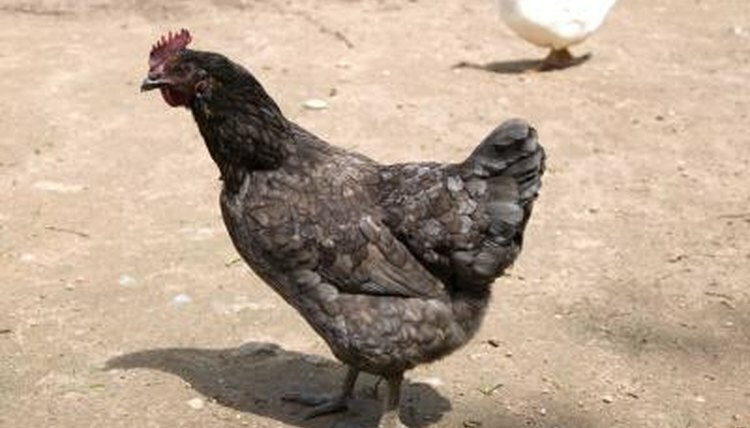 Typically chickens are the culprit and other species housed with or near them are the unfortunate victims. Chickens pose a known fatal disease risk to both turkeys and pheasants and should not share quarters or grazing areas with them. While not risk-free, it is possible to keep chickens with ducks, provided both have ample space outside where chickens can scratch without drowning and ducks can swim and wander free of chicken harassment. They're borderline compatible because they don't compete for exactly the same resources. Ducks need space on the ground and very low roosts, if any -- less than 1 foot, much lower than chickens -- but don't allow them to roost under chickens, who drop lots of waste in their sleep. Chickens, on the other hand, need waterers too small for ducks to swim in and foul. Beware, drakes sometimes kill hens, and chickens, especially roosters, may violently abuse ducks. Guinea fowl are the most compatible birds to keep with chickens, but even this relationship may devolve into violence. Adult chickens will kill baby guineas, but once those guineas are grown it's a different story. Adult guineas tend to harass adult chickens. Usually this is good-natured fun, like pushing off roosts and scattering hens. However, there are anecdotal stories of adult guineas killing roosters. It's also wise to remember that stress drives chickens to attack one another, so adding rambunctious guineas can exacerbate existing problems. If you plan to give it a try, introduce adult animals slowly and with supervision.